Hi dan salam kepada semua pembaca blog! 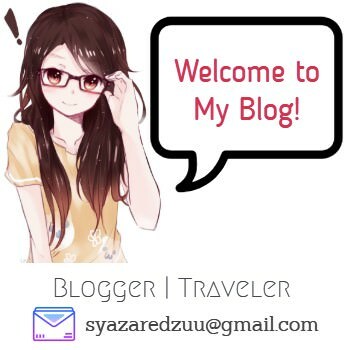 Kepada yang baru terbaca blog ini, welcome guys! Hehe. Blog SR ini memang banyak informasi berkaitan dengan International Student Exchange Mobility program (ISEM) - siapa budak UniKL confirm tak tahu, kalau tak tahu maksudnya anda yang tak nak ambil tahu. Rugi! haha. Lagi satu program pertukaran pelajar iaitu ERASMUS+ (tajaan penuh oleh European Union). Nak terbang jauh ni dik bukan senang. Bukan takat CGPA kena tinggi, involvement dekat kampus kena aktif tapi persediaan untuk memohon program di atas WAJIB ada. Hati kental kerana kalau kau malas nak baca, kau malas nak bertanya pada akhirnya... Borang yang kau dah print itu tidak dihantar pun kepada pihak UniKL International Office. Pastikan baca blog entri sebelum ini berkaitan dengan ERASMUS+ dan ISEM mengenai dokumen-dokumen yang perlu disediakan sebelum permohonan boleh dihantar. 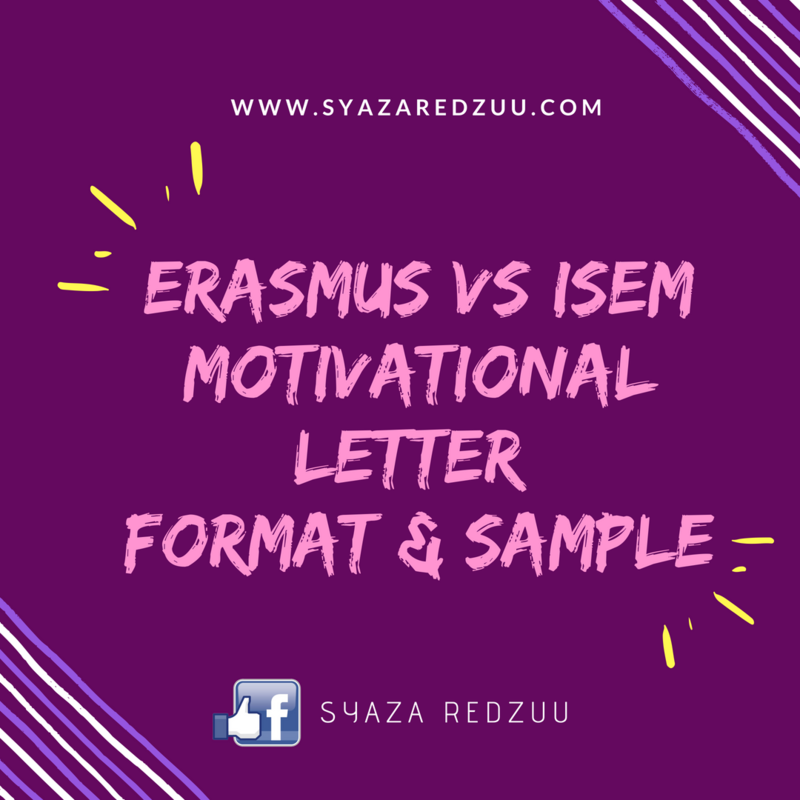 Sis, ada format motivational letter tak? Sis, macam mana cara untuk tulis motivational letter yang sebetul-betulnya? To be honest, aku rasa susahlah untuk orang berkongsi motivational letter kepada orang lain. Entri ini khas untuk pembaca blog aku. Ya, aku kongsikan dengan harapan korang dapat manfaatnya. Jangan copy paste pulak bulat-bulat. Jalan ceritera kita berbeza dik! Haha. Ubah ikut kesesuaian okay. Maafkanlah sekiranya ada grammatical mistakes ya. Haha. Ini coretan aku pada tahun 2016 taw! 2 tahun berlalu sudah. Anggaplah ini sebagai satu panduan untuk menulis. Make it simple guys! Tak payah tulis 3-4 pages. Melampau sangat tu. Lebih afdal kalau boleh muatkan dalam 1 page. Kalau rasa 1 helai tak berapa nak cukup (tetiba banyak pulak idea nak menulis muncul entah dari mana. haha! ), tambahlah lagi sehelai. 2 pages cukup. Ada sesetengah universiti yang meletakkan syarat muka surat. Ada yang meminta calon hanya menulis 1 helai sahaja (tidak boleh lebih). Yang ini homework untuk mereka yang ingin memohon program pertukaran pelajar. Kalau tak tahu? TANYA! Jangan buat tak tahu aje dik! haha. I am pleased to write this letter in order to apply for a position in Erasmus+ program. My name is Nur Fatin Syazana Binti Mohd Redzuan, student of Bachelor of Business Administration in Management and Entrepreneurship at University Kuala Lumpur (UniKL) Business School. With this letter, I would like to express my strong interest for participation at Erasmus+ program in September 2016. Therefore, I would like to spend upcoming semester of my study course at Kozminski University (KU). I would honor the opportunity if you accept me for the Erasmus+ program as it will give additional value to myself for my future career prospective. Thus, it would definitely be the best platform to improve my English proficiency and Business Management skills. I have been appointed to become one of the Student Ambassadors UniKL Business School in October 2015. The events handled by UniKL’s Student Ambassadors are platforms for ambassadors to meet and greet people to come and join UniKL for pursuing study in Degree, Master Degree or PhD. I have shown a good role model to UniKL students by actively involved in events, programs and activities and able to excel in academic performance at the same time. I have the chance to enhance my communication and interpersonal skills throughout the extracurricular activities. I have met many people from different backgrounds which made me to understand better and respect their cultures and lifestyles. I had a wonderful experience in handling new students. Being appointed as Orientation Committee, it was indeed a huge responsibility for me. It is not all about getting certificates for passing through the Training of Trainer camp. The sense of responsibility is vital for me. I was the Orientation Committee under Discipline, Safety and Welfare Bureau which required me to take care of the students’ welfare, health and safety. The committee taught me on how to collaborate and communicate as a team. Team building was vital to ensure every slot sessions went smoothly. It was a critical situation for me when a female student cried as she claimed that she could not walked. Thus, I had assisted the student and took her to the nearest hospital. It was my first time handling student who had cramped her legs. My committee members and I accompanied her to the hospital. We reached the hostel by 4am. I took the initiative to take care of her to ensure she was in a good condition. The student appreciated my effort as I was willing to take care of her at that time. I have inspired her to be a good student and excel in studies as when there is a will, there is always a way for her to succeed in life. I was searching for convenient universities that offer the best opportunities and fit best to my needs. Through the search, I came across the announcement of Erasmus+ program, which seemed to be the right opportunity that I was looking for. Through further search, I found that KU has a very good rank in world ranking of universities in the major of Management. All these reasons together made KU is my number one priority among all universities. On top of that, I want to study at KU because of its outstanding educational system which focused on laboratory research, business plans and advanced technology facilities. I am confident with my choice. There are various reasons that make me want to study at KU. First of all, KU is one of the best universities in the field of Management. Since I aspire a career in Management and Entrepreneurship, studying at KU would be of a great help considering job prospects at the bulge bracket banks, since former students of KU are highly regarded in the financial world. I was also got more excited when I noticed that you offer courses that are related to my field of study. The courses offered by the university would provide me with a deeper understanding and more insight in subjects that are necessary for my future career path. This unique, once-in-a-lifetime opportunity is a big advantage of the program. From my point of view, this is the chance to gain international experience in one of the most beautiful cities in the world. By studying abroad and having a good time with other international students, it will broaden my horizon. I can widen up my connections with other students from all over the world. Studying abroad at KU is a perfect opportunity for me to meet a completely different culture, learn Polish, experience other educational system and enrich my curriculum vitae, as well as gain more independence. Given my past history of commitment to achieve my dream, I am confident that I will exceed the expectations, because of both my academic and interpersonal skills. I will enrich the program by enabling fellow students and professors to benefit from my ambitious and open nature. Furthermore, my international background will add more diversity to your program. I am pleased to write this letter in order to apply for a position in exchange program. My name is Nur Fatin Syazana Binti Mohd Redzuan, student of Bachelor of Business Administration in Management and Entrepreneurship at University Kuala Lumpur (UniKL) Business School. With this letter, I would like to express my strong interest for participation at exchange program in September 2016. Therefore, I would like to spend upcoming semester of my study course at IE University, Spain. I would honor the opportunity if you accept me for the exchange program as it will give additional value to myself for my future career prospective. Thus, it would definitely be the best platform to improve my English proficiency and Entrepreneurship skills. I was searching for convenient universities that offer the best opportunities and fit best to my needs. Through the search, I came across the announcement of ISEM Program, which seemed to be the right opportunity that I was looking for. Through further search, I found that IE University has a very good rank in world ranking of universities in the major of Business Administration. All these reasons together made IE University is my number one priority among all universities. On top of that, I want to study at IE University because of its outstanding educational system which focused on laboratory research, business plans and advanced technology facilities. I am confident with my choice. There are various reasons that make me want to study at IE University. First of all, IE University is one of the best universities in the field of Business Administration. Since I aspire a career in Management and Entrepreneurship, studying at IE University would be of a great help considering job prospects at the bulge bracket banks, since former students of IE University are highly regarded in the financial world. I was also got more excited when I noticed that you offer courses that are related to my field of study. The courses offered by the university would provide me with a deeper understanding and more insight in subjects that are necessary for my future career path. This unique, once-in-a-lifetime opportunity is a big advantage of the program. From my point of view, this is the chance to gain international experience in one of the most beautiful cities in the world. By studying abroad and having a good time with other international students, it will broaden my horizon. I can widen up my connections with other students from all over the world. Studying abroad at IE University is a perfect opportunity for me to meet a completely different culture, learn Spanish, experience other educational system and enrich my curriculum vitae, as well as gain more independence. Aku terasa dalam mood angelic sikit hari ini memandangkan aku bukan sahaja berkongsi 1 motivational letter bahkan dua! Nak siapkan surat ini tidak memakan masa yang lama cuma idea untuk diletakkan dalam surat itu mungkin memakan masa. Cuba duduk dan fikirkan apa yang harus diletakkan dalam surat tersebut. Cuba bezakan apa yang lain dalam kedua-dua surat di atas? Senang cerita, secara keseluruhan isinya sama. Yang berbeza program, universiti, sebab kenapa ingin menyertai program pertukaran pelajar di universiti itu. Eh! Surat ini macam nak angkat bakul sendiri je! 1. GO BACK TO BASIC! Ya. Go back to basic guys! Ambil subjek Academic Writing kan? (Tipu tak ambil. haha!). Simple je. Pastikan sekurang-kurangnya ada 5 perenggan. Ada introduction, 2 atau 3 isi utama dan penutup. Boleh digunakan secara percuma dan boleh diinstall dekat Chrome! Woohoo nice one! 5. PUAS HATI? BOLEH SAVE DAN SIAP! Apa-apa tak faham boleh tanya directly dekat FB page ya. Good luck kepada yang ingin memohon ISEM/ERASMUS+!